If you’re the owner of a 2010-2012 Buick LaCrosse, Regal, Chevrolet Equinox and/or GMC Terrain equipped with either an LAF or LEA 2.4-liter four-cylinder engine, this post is for you. 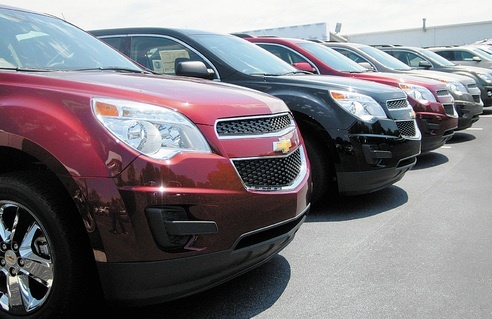 General Motors has sent letters asking 778,956 owners to take their vehicles to their local dealership to reprogram the software that monitors the oil system. Apparently, the vehicles are at risk of going too long in between oil changes, something that has yielded a higher-than-normal number of warranty claims for the engine’s balance chain. The balance chain is the part that links the balance shaft to the crankshaft, and a worn one can produce higher noise levels. The service will be done at no charge until Feb. 28, 2015. Though afterwards, the dealer could charge the customer. Previous story Community Question: Should Cadillac Continue To Offer A CTS Coupe? Obviously R&D needs attention on the “Three R’s”. Rush to production,Recall & Regrett!! Wow, people with the LY7 3.6L were/are screaming for this and have found no results. People were replacing chains of first gen CTS’ like they were belts. There should be no need to worry about a chain yet there were cases that people had catastrophic damage to valves after 100k miles. I have a 2010 Equinox with the 2.4 and got the notice a few weeks ago. I have never waited for the Oil Change Indicator and usually change with it at about 30% so this really does not apply to me. Even though the Oil Change Indicator calculates the interval based on your driving/environment/etc., I feel that a little extra protection (I also run synthetic as well) for the life blood of the engine is cheap security that I will not have problems. I have a 2010 Terrain with this engine. Despite the fact that I change my oil at 3,500 miles – my dealer voluntarily replaced the engine at 40,000 miles due to this chain problem. I appreciate that GM is stepping up to the plate on this issue! We have sold a lot of these LEA-equipped Equinoxes since intro in 2010 and have not seen many problems with the chain (or any part of the motor). I have already had customers commenting that the oil change monitor interval is much shorter on their Equinoxes than other GM vehicles they have or do own. Wonder how much shorter this will make that? My grandma has a 2011 Terrain with the 2.4! How can you tell if it’s a LEF or LEA engine?